iMAL invites Rotterdam-based artist Ricardo O'Nascimento and his Wearable Facade project for a workshop and urban performance on smart garments and generative patterns. Wearable Facade is an apparel that captures the colours and shapes of its environment through micro-cameras, and translates them into computer-generated patterns displayed on its LED surface. Walking through the city, the Wearable Facade can reflect surrounding architecture, or "replay" patterns recorded in different areas of Brussels or Europe. Wearable Facade takes its inspiration from the increasingly numerous "media facades" that appear in cities across the globe; those LED-covered buildings that turn architecture into screens. 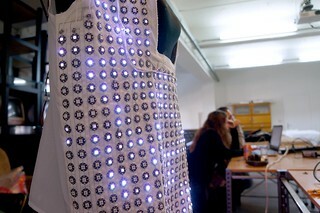 Wearable Facade appropriates the idea, and applies it to fashion design, into a smaller-scaled, more mobile and accessible device. iMAL will invite (fashion) designers, digital artists and students to a workshop led by the Wearable Facade team (Ricardo O'Nascimento & Erik Overmeire). Together, they will investigate the neighbourhood and create generative patterns that translate the urban environment into graphics.. The idea is to look at the city from another perspective, try to retrieve its essence and convey it in terms of colours and shapes.